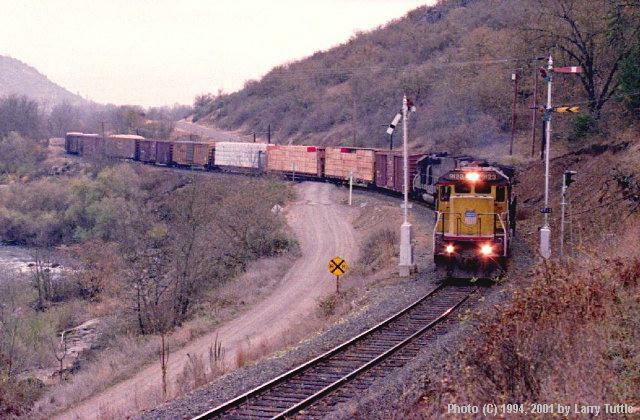 Union Pacific 9123, a GE C40-8, leads two SP tunnel motors along the Rogue River between Tolo and Gold Hill, Oregon in November, 1994. Note the newly installed tri-color signal turned away -- these Semaphores are seeing one of their last trains. SP's presence on the Siskiyou Line is in its last days as well, for as the calendar rolls to 1995, the Central Oregon and Pacific will take control of the Siskiyou Line. At this time, the south end (Ashland -- Montague) was out of service and this train, the Medford - Eugene Manifest, carried all the freight that was to leave the Rogue Valley by rail. Behind the second centerbeam is a Wig-Wag that is still in service today.